Happy opening week! MLB Baseball is back in action, which means it’s time for hot dogs, nachos and beer… unless you’re smart enough to pair your dogs with wine. 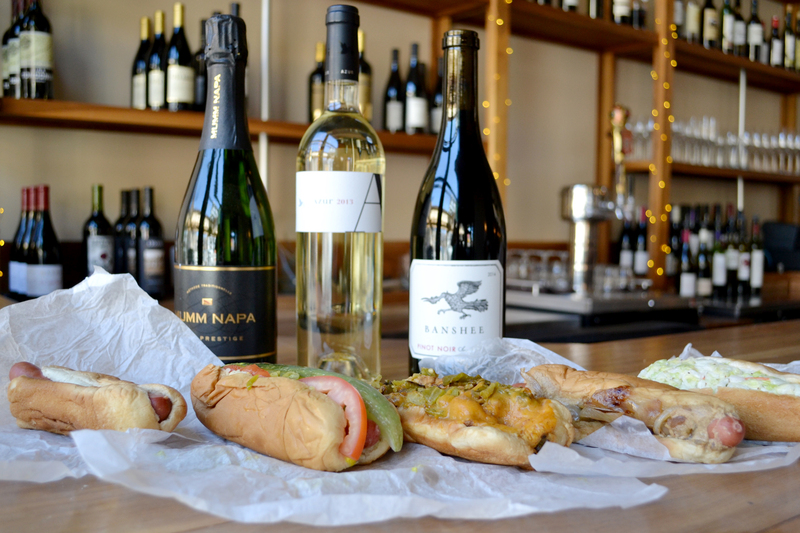 I teamed up with award-winning sommelier Liz Mendez (Vera Restaurant & Wine Bar) to bring you the best wine and hot dog pairings using classic dogs from across the country. Since baseball is America’s past time, I attempted to pick domestic wines that are relatively easy to find. We tasted with Mumm Brut Prestige sparkling wine, Azur Sauvignon Blanc and Banshee Pinot Noir, and Liz threw in a Sherry, because, what goes better with a hot dog? 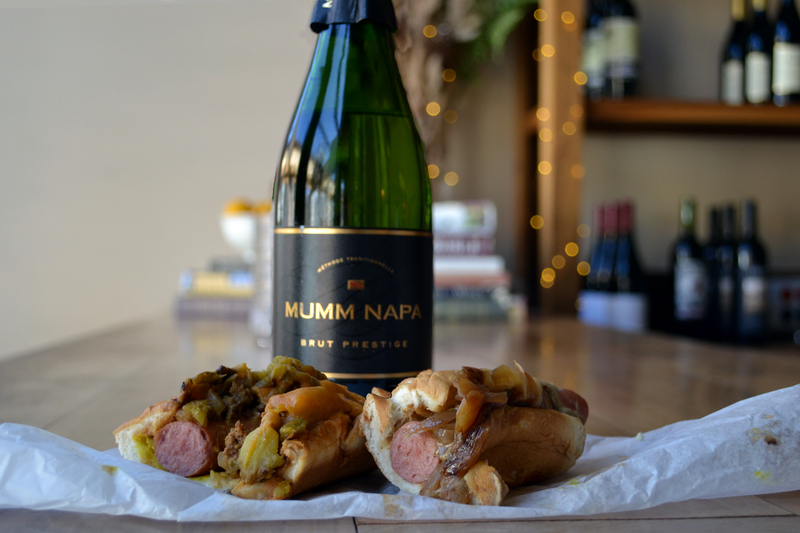 Mumm’s Brut Prestige pairs well with every hot dog we tasted, especially since the bread mimics the toasty, yeast nuances found in the sparkling wine while the briney-ness of the hot dog plays off the minerality of the wine. The Brut Prestige paired best with the New York City Dog & the Texas Dog. The New York City Dog was slightly sweet from the grilled onions, and the sweet notes played best with the sparkling wine. Even the hints of spice from the mustard worked well with the bubbles. The Texas Dog was incredibly spicy, and therefore, the bright crisp flavors of the bubbles balanced out the spiciness without one overpowering the other. *See note below about the Texas Dog with Sauvignon Blanc. Azur Sauvignon Blanc is made by a French winemaker in Napa Valley. Why am I telling you this? Becuase it is so much more delicate than your typical new world Sauvignon Blanc. It paired incredibly well with the subtle flavors of the coleslaw and therefore was the perfect match for the Atlanta Dog. We also liked how the creaminess and the soft acidity balance each other out. Had the Sauvignon Blanc been from New Zealand, it would’ve paired well with the Texas Dog too. The big, bold flavors of a grassy, gooseberry filled Sauv Blanc would’ve stood up to the spice and to the green pepper topping. Tio Diego Amontillado and a Chicago Style Hot Dog (insert Italian chef kissing fingers gif). Liz is a Sherry ninja, and she didn’t think twice when telling me what to pair with a Chicago Style Dog. My actual note was ‘holy cow the wine just compliments it all perfectly’. To be a bit more technical, the mustard, onion, tomato and pickle pull out the salinity of the Sherry while the richness plays off the meatiness of the hot dog. This was such a cool pairing that I highly recommend stocking up on some (quality) Sherry for the season (it’s a surefire way to impress your friends!). Did you notice that one wine is missing from this list? We tasted the Banshee Pinot Noir but haven’t listed it with any hot dogs. Truthfully, we didn’t feel that it paired well with any of these dogs. For that reason, we want to challenge you! Send us your favorite Pinot Noir and Hot Dog Pairing, and we’ll post our favorite, and send the winner a bottle of delicious Pinot Noir! You can submit your entry in the comments below or email to support@tayloredwines.com. Cheers! Ooooh, I’ve been thinking of a Pinot Noir + grill night… I might have to take you up on this challenge! I’m a bit surprised that you didn’t try a Viognier, which would be my choise. Specially when the Sherry works well as presumed. I would easily go with a White Rhône valley wine. Excellent suggestion. We tried to stick to readily available domestic styles since baseball is ‘America’s pastime’, aside from the Sherry that was pulled from behind the bar! 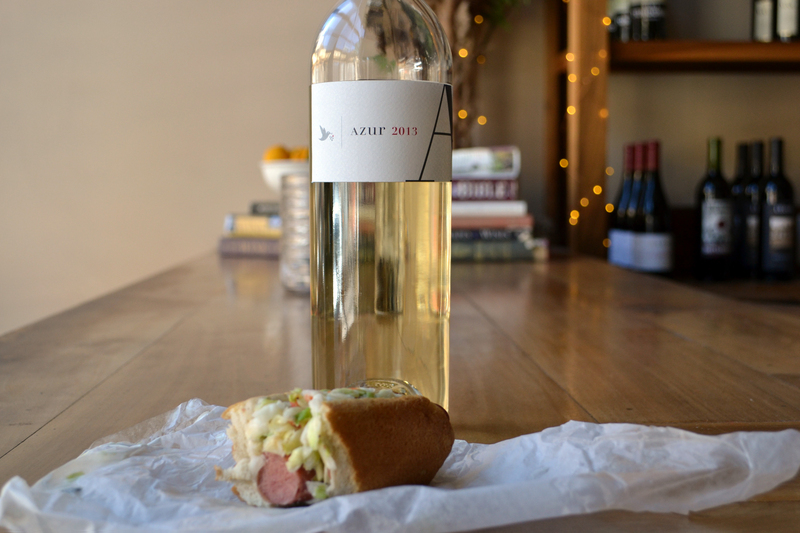 That being said, Viognier is an excellent suggestion and would pair quite well with many of the hot dog styles. Cheers!